"Lazy Man's Guide to Philmont..."
Rest and relaxation at Philmont near Cimmaron, N.M. in the Sangre de Cristo Mountains. Philmont is kind of a lifestyle for the people who go there. At least, those who enjoy it the most are perhaps those who can get out of the continual organization and regimen of the day-to-day. 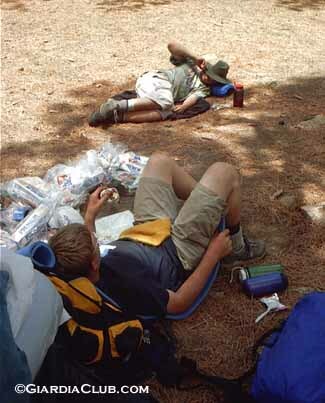 We'll be giving some tips and advice on backpacking at Philmont in the coming pages. But before that, it's worth considering the real reason you go there. Backpacking and outdoor adventure is just one of the things that you pick up on the trip. What you'll remember longer are the friends you make and relationships that deepen while you're in these mountains, away from phones and the normal demands of civilization. So, sometimes it's good to just sit back and enjoy the ride. Lay back and watch the wind whisper through the tops of the pine trees. Fell the softness of the white fur needles as you brush along side them. Say howdy to the crews that go by you - they're from all over the United States and even the world. And of course, discuss the merits of the pack food, some of which was accidentally burned to the bottom of the pan. Philmont - tips and advice.